The SleepSack™ wearable blanket reduces the risk of rebreathing (the inhalation of carbon dioxide), which has been associated as a possible cause of sudden infant death syndrome. 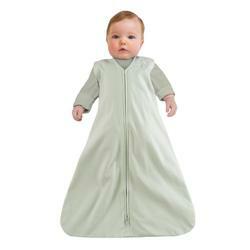 The SleepSack™ wearable blanket allows your baby to stay safe, warm and cozy all night long. The SleepSack™ wearable blanket replaces loose blankets for safer sleep. It's the wearable blanket that carries the "#1 Safe Sleep Product" gold seal from First Candle/SIDS Alliance. NOTE: Our flower, car and jungle are NOW ON Clearance. THE wearable blanket that carries the "#1 Safe Sleep Product" gold seal from First Candle/SIDS Alliance. Reduces the risk of rebreathing (the inhalation of carbon dioxide), which has been associated as a possible cause of sudden infant death syndrome. Generous sack design allows room for kicking, but can’t be kicked off so baby stays warm all night. Inverted zipper makes diaper changes easy, won’t pinch baby’s skin and makes it harder for an older child to unzip. Sleeveless design allows for ventilation and reduces the risk of rebreathing into sleeve. New embroidered message on chest reminds caregivers to place baby on his or her back. Slips on easily over a regular sleeper or diaper. Machine washable and dryable with like colors. Available in Soft Pink, Baby Blue, Baby Yellow, Cream, Crazy Car Print for boys, Fancy Floral Print for girls and a Jungle Print for either. Made of 100% interlock cotton. iParenting Award winner and HOT Award winner! Small 0 - 6 months 23" - 26" 10 - 18 lbs. Our 100% cotton is great for use in warmer temperatures. Machine wash with like colors. The U.S. Consumer Products Safety Commission warns against the use of loose bedding in the crib. Bedding that bunches up or contours around a baby’s mouth or nose can cause dangerous rebreathing of carbon dioxide. A percentage of every SleepSack™ wearable blanket and SleepSack™ swaddle sale goes to First Candle/SIDS Alliance to support SIDS research and education.